Marijuana Use and its Effects on Mental Health | Building A Safer Evansville, Inc. Marijuana puts me in a better mental state. 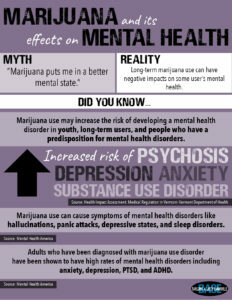 Long-term marijuana use can have negative impacts on some user’s mental health. Marijuana contains psychoactive chemicals, meaning it directly affects your mind. Anytime something is affecting your brain, even in the short-term, it can have lasting effects on mental health. Studies have shown that use of non-medical marijuana can increase risk of psychosis, anxiety, depression, and substance use disorder for youth, long-term users, and people who have a pre-disposition for mental health disorders. Marijuana use can cause symptoms of mental health disorders like hallucinations, panic attacks, depressive states, and sleep disorders. Adults who have been diagnosed with marijuana use disorder have been shown to have high rates of mental health disorders including anxiety, depression, PTSD, and ADHD.